At last the tulips think it is time to put on a show. Despite the fact that those I thought were going to be late flowerers, and white, have turned out to be early by this year's standards, and primrose yellow, I'm still pleased to see them. 8/5/13 - STOP PRESS: I've just been looking at various websites and I think they are Floradale Ivory - a late Darwin hybrid tulip - so maybe I just didn't read the description very well! My zinc tub is rather restrained in its palette of tulips so far - very peachy and apricot in its present incarnation. I know that I planted Perestroyka, Apricot Beauty and Abigail in it, so am having to go back to the saved packets to identify them as they emerge. The pointy bulbs will definitely be Persetroyka and I'm pretty sure the smaller ones are Abigail. I think I prefer more punchy colours in this pot though, so may have to rehome these in the flower bed later and have another go with more melodramatic ones next year. In the flower border, the established residents are still putting on a show, even though they have been in there for a long time. Their blooms are definitely smaller than they used to be, but still worth having. I think these orange 'Ballerina' tulips are still one of my favourites - so in your face and shouty! Ballerina is indeed lovely, I will have to plant some for next year. So cheerful at this time of year - makes you feel that things are really starting to come alive again. Love your Yellow tulips,its so nice to see our tulips again. Hope they last a while in bloom of you . Mine are still in bud. I love the pale colour on the outside of the petals - very restrained. The brighter insides make them glow, latern-like which is fun - especially as they are such giants. Would love to know what they are. They were in bud for about 5 weeks and I was losing patience! What are the purpley ones next to Ballerina? They're a wonderful rich shade. 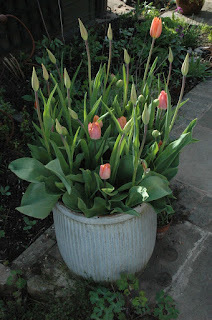 My next blog post will be a tulip-centred one - just need to get more pictures taken. The purple ones are 'Passionale' - they've been great for about 4 years as well. Look forward to spotting tulips on your post! The tulips in the zinc tub look so pretty! Perestroyka, the tall pointy ones, have opened today - gorgeous. They are also a peachy shade but much bright rather than pastelly. I've decided I definitely like LOUD tulips best. I think zinc tubs and baths are the fashion this year, we all seem to be using them! I've found this is the only way I can get tulips to flower reliably because of our heavy clay, they usually only last one year with us. I like your yellow ones even though they aren't the colour you wanted! I've got a couple of friends with zinc dolly tubs who aren't using them.... do you think I should bribe them with bunches of flowers to pass them over into my tender care?! My soil is fairly heavy clay too, although I have added leaf mould and muck, and tulips seem to survive reasonably well, even after the wet of the last couple of years. For years I thought I couldn't grow tulips, but they seem to be very happy in this garden. You could always try a raised bed for them - mine seem to be extremely happy in theirs. I also love the ballerina tulips with the purple combination. I thought I bought something similar this year but they came up white. Sometimes bulbs are just a mystery! I'm with you there. It can be a bit annoying after you've waited so expectantly for the flowers to develop, only to find it isn't what you ordered - but sometimes, like my yellow imposters - it turns into a happy accident. Reassures me that it isn't only me who occasionally mislabels plants.